Style # DWB-01 paired with a solitaire engagement ring. In my opinion, one of our most versatile diamond wedding bands is our stunning infinity diamond wedding band. Many women love the look of diamond wedding bands and now more than ever, it is popular to purchase more than one wedding band in order to be able to mix and match your bridal set. If you are interesting in finding a new ring that can be paired with an engagement ring, I highly recommend an infinity diamond wedding band. The width of this band measures approximately 4mm at the widest point and features F-G color diamonds with VS clarity. 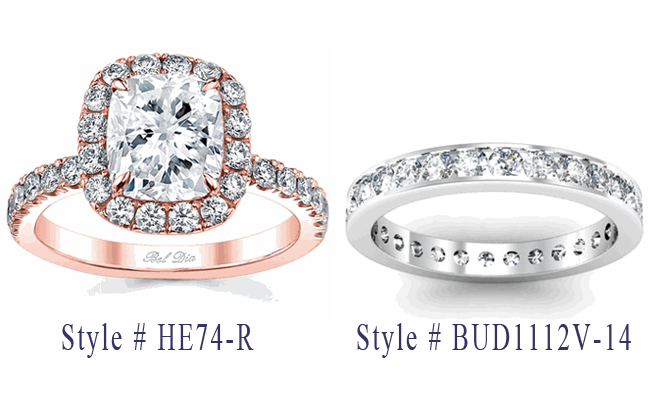 We offer the ring in 14 karat gold (yellow, rose, or white), 18 karat gold (white or yellow), and platinum 950. The ring showcases the sparkling diamonds half-way around the ring. It can be worn alone, but I love the way it looks paired next to an engagement ring or another diamond band. We also design and manufacture our rings ourselves and would love to assist you in creating a custom piece. Please fill out our bespoke jewelry page and one of our designers will be happy to provide you with a custom price quote.